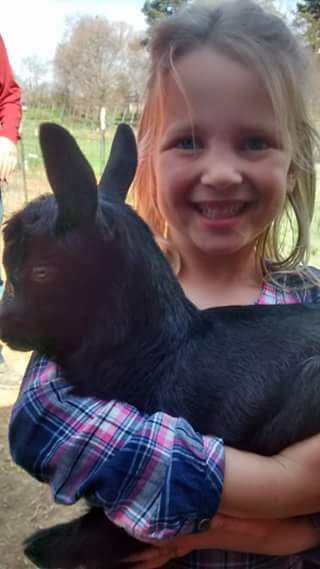 Thank you to all who came to our Baby Goat Experience! Goat Milking Demonstration in June at both our farmers markets. We've updated our web site several times in the past few years, but most of those changes have been under the hood. We've now taken those changes to give our site a radical new design and new ways of finding our wide selection of soaps. We've already added a page listing discounted soaps, Check out the new Soaps by Categories page, including newest varieties. Thanks! Also, if you have trouble using this site, you may still use the old version here Old Soaps Page. The "Great American Eclipse" was a beautiful sight! To commemorate the event, we have created our first activated charcoal soap, designed to look like the total eclipse so many people got to see. This is a great way to remember the event or for a gift to someone who got to see it or really wanted to. It's also great soap! Farmer's Markets We sell at two markets in our area. Click here for times and directions. Lesser Known Secrets: While browsing our soaps, be sure to check out these things too: Bargain bars, a helpful Printable Brochure, and Gift Certificates. Also, to avoid shipping charges, you can order online and request your order to be brought to one of our markets. Just choose "Bring to Market" on the shipping menu on the Shopping Cart page, and indicate which market you will pick up at in the comments. Our soaps are made with natural ingredients in many different scents, as well as other ingredients such as activated charcoal, oatmeal, dried herbs, coffee grounds, and even beer. Some bars are left unscented. Below are listed some of our most popular bars. Essential Oils are extracts of the natural oils in plants. Essential Oils are therefore 100% natural, and the best ingredient to make many of our wonderfully scented soaps while still having a 100% natural bar. Below are listed some of our most popular essential oil bars. Fragrance Oils are made synthetically. This allows many more delicious scents than are available with Essential Oils, and they are also less expensive, though just as luxurious. These soaps have no added scents. Perfect for sensitive skin and noses, yet still has all the nutritional benefits and the smooth silky feel provided by the goat milk in the soap. Throughout the year, we make special soaps to match the season. Fall scents include Apple Alamode and Pumpkin Pie, Christmas season soaps include Candy Cane and Gingerbread Cookies. We often have new seasonal scents every year. We have a number of other products available. These include lip balms, skin lotions, laundry soap, and bargain soaps. We are in the process of making more products including new scents and liquid hand soap. Our farm also produces a number of products. Check out our products page on our farm web site for information. Connect with us on Facebook, Twitter, or our newsletter to hear when new products are available. Our Baby Olive products are specially formulated for those with sensitive skin. They are the perfect addition to any nursery, and an excellent baby shower gift, but also a great choice for anyone who wants an extra gentle product. We use high quality organic olive oil and other gentle ingredients. Olive oil is a gentle moisturizing oil that will gently cleanse and soothe your skin. We can provide soap in a variety of custom ways, whole logs, hotel bars, party favors, bulk quantities, wholesale, and more. Read more about our soaps, their benefits, and how they're made here. For information about ordering and shipping, click here. Learn about the ingredients we use here. Use your credit or debit card in person or at our Farmer's Market or event booth. If you have a smart phone, you can use your credit card, to pay us at our farmers markets by coming to our web site and paying online. Our regular items and prices are listed, as well as an option to enter an alternative amount if the total doesn't equal what we have listed. We can also accept paypal. Click here to start your purchase! In addition to our regular products listed here, we often have a number of other products and services available. Find out more here. Our soaps are made with goat milk from our own goats. Our farm also hosts chickens and other animals, with other products. Find out more here. We host a number of events throughout the year to provide learning, interaction, and fun for our customers. These events each have their own unique emphasis. Model Solar System Display scheduled for Saturday, April 6, 2019. 201 Keith Street SW, Cleveland, TN 37311View Map. -See the planets beautifully painted and to scale with each other and to a 24 foot diameter sun! -Learn more details about the solar system. Just ask! Soap Making Demonstration scheduled for Saturday, April 13, 2019. 6503 Slater Road, East Ridge, Tennessee 37412 in the Antique mall behind Cracker Barrel. View Map. -Come anytime during the event to see a short 10 minute soap making demonstration, view our equipment, learn about soap making, and goat milk soap and its benefits. This event is scheduled at the same time as the Master Gardeners “Master Your Garden” Garden Expo at Camp Jordan Arena. So if you're going there on Saturday afternoon, be sure to come by the Cottage House. It's just on the other side of the Interstate from the Arena. We will post updates as each market approaches. 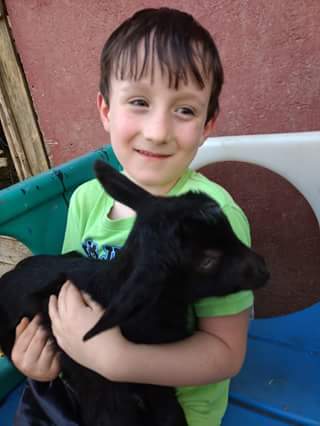 Baby Goat Experience Spring 2020 at our farm. Watch for info! 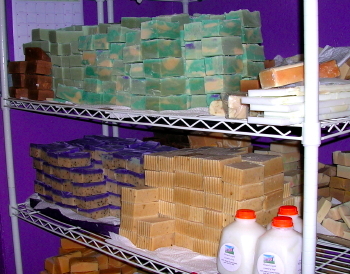 Our soaps business and goat farm means we have access to many products that are sometimes hard to find or more expensive to purchase individually or in small quantities. We also have certain items we accumulate that we would be happy to pass along to anyone who can use them. Below are some of the items available. Help us keep our costs low, donate your unwanted items to us. We're also looking for items that we use regularly. If you can donate them to us, it helps us keep our costs of production low, either by our ability to use the item directly, pass it along to others we know can use them, or in some cases sell them to provide some additional income. We are able to order a number of products in bulk, and order from certain companies fairly regularly. We are therefore able to sell bulk containers of certain items, and can offer convenient deliver and help you save on shipping by ordering items on your behalf when we place an order from the same company. Prices listed are approximate. Contact us for current prices. We are affiliates of our web host, www.emwd.com, as well as our shopping cart, www.dansie.com. We also have a number of other items available from time to time. We'll post them here if we think anyone can use them. We also accept donations of certain items which helps us keep the costs of running the farm low. Other small items in good condition (let us know what you have and we'll let you know if we can use it. We are looking for someone to help us with our web site. We would like to create a customer login as well as a more dynamic shopping cart. Contact us for details. Want to get a gift for a friend or loved one but not sure what they want? 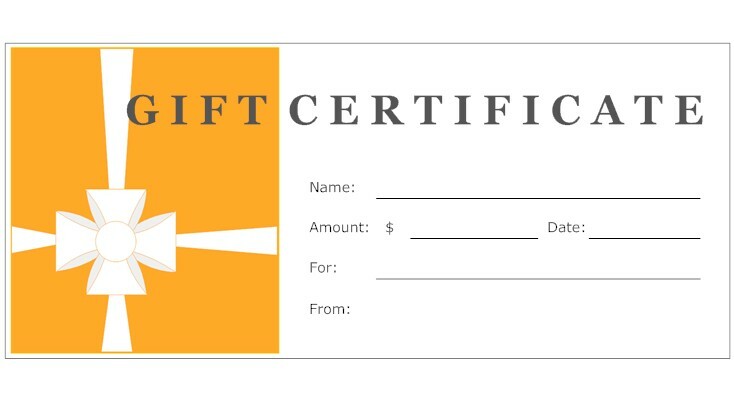 Order a gift certificate! Available in any whole dollar amount between $10 and $999. Enter an email address if this is for a friend and we'll notify them. A code will be put into the shopping cart to identify the certificate. We'll email you or your friend once the code is activated. Gift Cards are not discounted with other sale discounts or coupon codes. Use this space below to indicate what you are purchasing. Don't have cash or check at our Farmer's Market or when otherwise purchasing something directly from us? No problem! We can now accept credit cards through our web site if you have a smart phone with you. Use this form to enter your purchased items and total price. No shipping charges will be added. You'll be able to pick up your items once your transaction is complete, which only takes a couple minutes. Stock up on soaps, buy in bulk! Orders must be at least 22 bars, and can be up to 42 bars. To order more than 42 bars, order them separately. You can mix and match scents. You can order up to 34 bars for no more than $12 shipping within the continental USA. Short distance shipping costs may be even less for up to 42 bars! When shipping is less we will provide a refund. If shipping is significantly higher due to distance, we will contact you. International shipping will be higher. Bars cost $3.95 each, and you can save even more by ordering unwrapped bars. These bars do not count toward our buy 4 get one free offer. Unwrapped: Save 20¢ per bar by ordering unwrapped bars! Other Scents: Please enter total number of bars here and list the kind and number of each kind you want below. If you have trouble using this form or want to order soap not listed, please contact us for information. 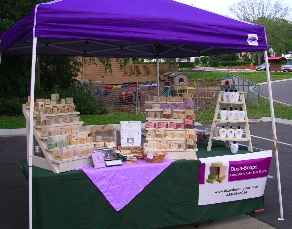 If you are interested in becoming a reseller or selling our soap in your store, please contact us for information. -A popup menu that provides an alternative to the < select > html tag. This framework is available for sale. I will send you all the base files to make it work, along with a file with instructions on how to set everything up. I will also include a 1 year service plan to fix anything that doesn't work as advertised. I can also provide additional support and add requested features for an additional pre-arranged fee. It does not provide a shopping cart, however I have designed it to work with the dansie shopping cart. It does not provide user/customer login. I am actually looking to add this feature but am not sure how. If you know, please contact us. I do not make any other warranties for fitness for a particular purpose or any other guarantees. Our Soaps are available in Dayton, Athens, Ooltewah, Dunlap, Grandview, Chattanooga, Powell (near Knoxville), as well as some locations outside Tennessee. Soap is also available at their other locations at Pikeville and Cleveland. Brainerd Farmer's Market, Saturdays 10am-noon April-October at the corner of Belvoir Ave and Brainerd Rd. in the parking lot of Grace Episcopal Church. Schedule changes January thru March. Winter 2014 hours are 11am-12 noon. Watch our facebook page and Brainerd Farmers Markets email for when we expect to be there. View Map. Olive Chattanooga, 112 Woodland Ave., Chattanooga, TN. This location features or Baby Olive bar soaps. You can purchase them directly from their web site or visit their store: View Map. The Cottage House, 6503 Slater Road, East Ridge, Tennessee 37412. This location features many local crafters and businesses. View Map. 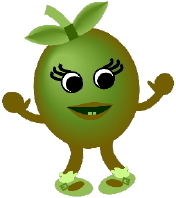 Phillip & Cindy's Natural Teas, Spices, Herbs and Honey Facebook page. 15781 Rankin Ave, Dunlap, Tennessee. Natural Affinity Soap, 131 Cherry Street in Dunlap TN. View Map. Grandview Mountain Cottages http://www.grandviewmountaincottages.com. This location is currently transitioning ownership. Contact us for details. We will relist this location when they are back in business. Naturally A Deal Market 3529 W Emory Rd, Powell, TN 37849 View Map. This location carries mostly our non-soap products and our bargain bars. You can also place orders for pick-up at this location and through other locations served by Naturally A Deal including Athens, TN, Dayton, TN, as well as several locations in central Alabama, Western Florida Panhandle, North Carolina, Lynchburg, VA, Ohio, and western Michigan. Contact us for details regarding pick-up. Save on Shipping: we can bring orders to our farmer's markets with no shipping charge. To pick up at a farmer's market, just order and pay online, then choose "Bring to Market" under "Shipping and Handling" on the shopping cart page, and indicate which market you'll pick up at in the comment box on the next page. We can sometimes deliver soap to our distributors as well, but please contact us first to confirm. Your Town, USA: Add your store to this list! 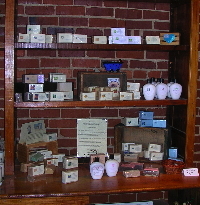 This photo was taken at the Lynchburg Community Market Heritage Crafters Gallery when we sold soap there before the move to Tennessee. We are looking for more resellers. To get our soap in your store contact us for information. contact @ dixiesoaps.com (remove spaces). You may click on this link to open an email in your email program. We will reply to you shortly, usually within 24 hours.